Of the sensations that come from reading an author's good first novel, one of the best is the dawning awareness that this could be the first of many. Better yet, it might even be the least of them. The letdown comes when, as page after page unfolds, small errors and bad habits repeat themselves. 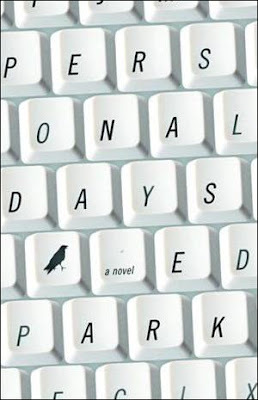 Personal Days, Ed Park's bleakly funny debut novel, manages to avoid most of the letdown by uniquely embracing some of the first-time author's pitfalls and employing them as a positive plot device. The book's title plays on the grim reality that many of us live the great expanse of our social lives in the workplace, in a kind of doomed struggle of depersonalization and hyper-personification of objects and small traits. To a certain extent, we never really can — and maybe don't even want to — know our coworkers. But through the force of repetition and mandatory proximity, small details of themselves and their tiny corporate habitats invade our consciousness and achieve nearly human dimensions. All these are our personal days, but nobody's actually taking time off. Park shows both the cramped spaces and bizarrely profound social investments we make in our co-workers' lives by telling the stories of a dozen mid-level employees of a moribund company, marooned on an increasingly empty floor of a New York high rise. Together, they're bound in anxiety over losing their jobs, excitement at the sudden independence of being fired and terror of doing anything to draw attention to themselves. Oddly, this semi-oblivion engrosses them. The best jokes come from the office. So do the freshest ironic nightmares. It's the most entertaining thing they have, but no one wants to ask too seriously if perhaps that's because it's all they have. A better versed literary critic could probably select a magnificent word of at least a dozen syllables to explain Park's technique, but suffice to say that it's a combination of investing workplace objects with an emotive sense of personification, identifying coworkers and phenomena via metonymy and a persistence of what Russian critics and authors call ostranenie. The last — literally "making strange" — is a technique of defamiliarization, where we imbue objects with a stronger significance because of changed perspective. Little things achieve metaphorical menace, foreign oddity, alien warmth. It's the sort of concept that explains how someone who's awakened to the same favorite rock song on his stereo alarm clock can, after years, experience it only as a harbinger of dislocation and terror; the way a a beautiful coworker's faulty printer, which truncates capital Rs, can make any sight of the ill-printed letter signify something precious to another; or the way a coffee table that two different people "straighten" every day in almost imperceptibly different ways can symbolize a vast and intractable struggle over personal geometry and order. This defamiliarization works two ways. First, it heightens the import of the workplace Park constructs. We increasingly spend as much, if not more, of our emotional existences while on the clock as we used to do in homes or bowling leagues or local bars. The great profundities of our internal lives get filtered through, poked and prodded, by the sorts of things that even a decade ago most people would have considered least likely to shape the majority of their feelings and sense of growth. That use of "making strange" exposes how we've been forced to import our feelings into our commerce, because we have no choice; we have no time for them anywhere else. As Park writes it, this process is inexorable but not unbearable. In bitter satire, the reality might be too much to bear. In three panels, in Dilbert, the horror is digestible. Park's characters' mysteries and stunted yearnings convey the process in a way both fascinating and funny. Like Dilbert, the mordant comedy leavens the latest indignities and provides incisive looks into the characters' lives without the need for cloying confessional or polemic. But the defamiliarization achieves a second thing: the obfuscation of the very common first-time novel errors. Most first novels stink of autobiography: one character written with exquisite narcissistic depth and surrounded by obvious straw men and the occasional success of a two-dimensional posterboard facilitator of dialogue or exposition. Whether deliberately or no, Park has ingeniously exploited the incompleteness of characters in early novels and put them to use to explore the two-dimensionality of understanding our co-workers. If we don't really know his characters, even if that ignorance comes from Park's shortcomings — in most cases, I don't think it does — it almost doesn't matter. That alienation, that sense of constantly bouncing amongst a series of cutouts and wraiths, enforces the uncertain distance of office life. Like all first novels, Personal Days does suffer from one or two missteps. One is the almost too-neat ending and its astonishing revelations. The other is how Park might have taken the theme of alienation too far. Perhaps wary of calling too much attention to the two-dimensionality of characters, he doesn't bestow on them enough easily identifiable traits. A big nose here, too many hats there, maybe a penchant for slogan t-shirts: all these would have given the characters more separation from one another, but also opened the door to criticism of Park as a hacky, shortcutting stylist. It's too bad he didn't take the risk, because even a few days of separation from the introductory chapter renders many of the characters nearly indistinguishable from one another. Their desks and tasks set them apart, but their physical traits blur. This vagueness becomes an especial pity in that overly neat final chapter. Put simply: it's the best part of the book. A breathtaking monologue of desperation, wit and emotion, it vivifies and actualizes all the latent pity and ache of everything preceding it. But while the first reaction might be that the events related are too lucky and a little too clever on Park's part, the enduring sense is regret that, here, finally, is a relentless and sudden dedication to open emotion that's directed... where? The recipient, one of the main characters, has over the course of the book dissolved into the indistinct workaday background so much that one wonders how and why she inspires such a fervid outpouring. The final chapter stands as a triumphantly unashamed display of human need and admiration, only its intended recipient is subsumed by the mild dehumanization of the collective environment. Perhaps, in the end, that's Park's point. Depending on the mood, this rating could probably edge toward a 4. Highly recommended for anyone who's worked in a large office, Dilbert fans, critics of the modern workplace, people who need a toilet novel, anyone who likes biting looks at thirtysomething existence. Not recommended for anyone who takes book-cover blurbs literally. The cover suggests that P.G. Wodehouse might have written this novel if he worked in a modern office, which suggests the woman who wrote it hasn't read much Wodehouse. While the ending shares something of Wodehouse's abrupt style, the comedy is far blacker and more socially conscious. Wodehouse's satire was never so hopeless or so diffidently cruel. While his plots often relied on the notion that hope springs eternal within the human breast, almost every character in his stories had those hopes rewarded.